What's the surest way to fail in a leadership role? Lose sight of the values that attracted you to the company culture. In Unleash Your Values, a retired Army officer reveals why so many officers and enlisted commit for an entire career. Because they found a place where they can live their lives and their beliefs within the bounds described: the company's values. Corporate values are critical to retaining your best employees. Leaders are responsible for maintaining the corporate culture, and they do this by upholding the values. Values are the heart of what attracts and retains people to your organization. When people feel they are in a place where their company values match their own, they feel aligned. They become more committed and engaged. They are happier, more productive; the essence of great teams. 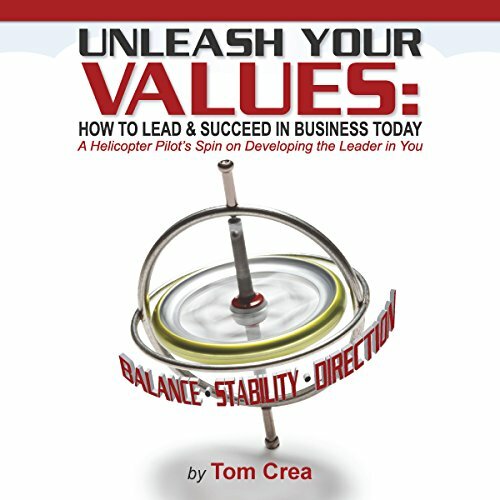 Author Tom Crea shares first-hand experiences about developing as a leader within a supportive environment. He takes you on his journey along the skills curve, revealing how communication skills are increasingly more important for your leadership development journey. Each chapter is broken into several sections where he recaps crucial points in his keys to leadership success and business insights, and includes steps for the leader to apply. Today's businesses are in need of good leaders more than ever before. Leadership isn't easy, but it is so much easier when your values are aligned. Unleash Your Values shows you how to identify what is most important and develop the presence and confidence to display your true character. An Army officer and former aviator, Crea cracks the code for developing leadership in a world where businesses crave helmsmen who steer the organization in the right direction. In Unleash Your Values, he breaks down the leadership development process into five steps, making it simple for you to visualize, outline, and begin your own journey.